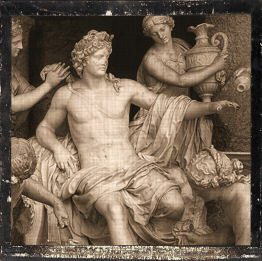 Blessing: Apollon’s blessings are beauty, healing, justice, strength, artistic and athletic skill, as well as prophecy. He helps people to find ways to become better than they are. He heals all ailments — spiritual as well as physical. He punishes unjust acts, yet helps those who have committed them to find redemption and purification. He inspires the best work by poets and sculptors, atheletes and scientists. He communicates to man the will of his father, Zeus, making known what was hidden. Above all he preaches the Hellenic ideal of moderation and nothing to excess. Equated with: Horus, Helios, Re, Mithras, Bel, Antinous, Asklepios. Ways to honor: Live excellently. Don’t shirk your responsibilities, or do things you know are wrong. Put your core values into practice: don’t just preach it, live it. Cultivate the arts. Write, draw, paint, dance, play an instrument, sculpt or support those who do. Read philosophers, and try to think outside the box. Learn and practice a form of divination. Practice a healthy lifestyle and exercise. Take an interest in what you eat and how it affects your body. Visit the sick. Donate time or money to AIDS or cancer research and treatment or other health concerns.